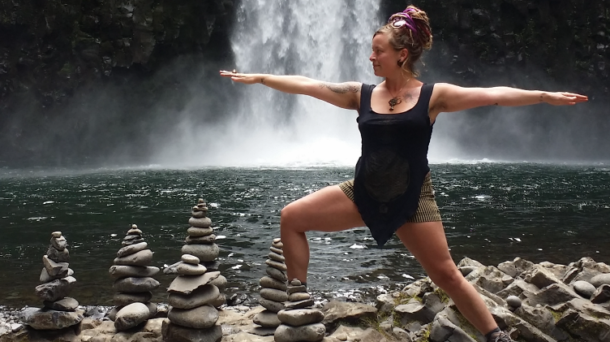 Amber’s style is Hatha-focused and all-levels. Combining physical asanas with focus on the breath, Amber integrates many levels of teaching in a multi facetted approach. Class is always different. Speed is slower to help counter our cultural tendency to do more. If you are completely new, it can be helpful to take a private lesson. Always practice at your level of comfort and trust your body. EDGU is a spinal movement maintenance practice. It has been taught at Breitenbush Hot springs for over 20 years. It’s a guided meditation combined with dynamic action to move the shoulder/arm/hand through all possible motions. Improves spinal health, helps to open the torso and build leg and pelvic floor strength. Can be practiced standing in goddess stance or seated. No equipment required. Weekly EDGU in the park times vary. Check social media for the most up-to-date information. Sign up for the newsletter for updates. Want to know when Amber is teaching? Join our mailing list, and stay up to date.